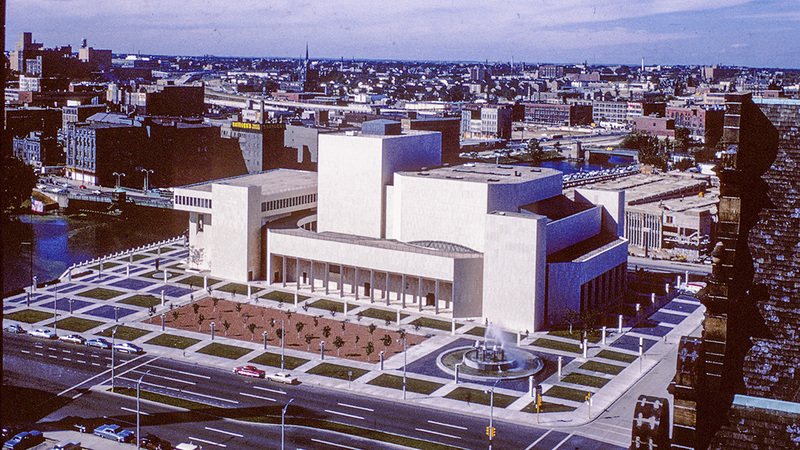 Construction on what was at first known as the Performing Arts Center of Milwaukee began in 1966. Located beside the Milwaukee River, the building was designed by architect Harry Weese and the landscape by Dan Kiley. The facades of Weese’s Brutalist building were articulated in bold but simple planes of travertine. 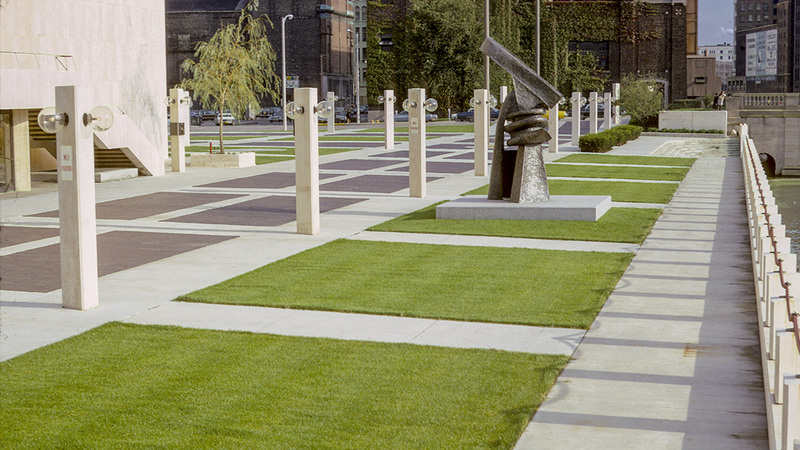 Equally bold in form and simple in materiality, Kiley’s landscape comprised a grid of grass rectangles set within the pavement surrounding a central, trapezoidal plaza directly south of the building. That central space, sunken three steps below the adjacent walkways (recalling the better-known South Garden at the Chicago Art Institute, designed and constructed from 1962 to 1967), mimicked the conversation pit of the famous Miller House and Garden, which Kiley had completed with architect Eero Saarinen in Columbus, Indiana, in 1957. 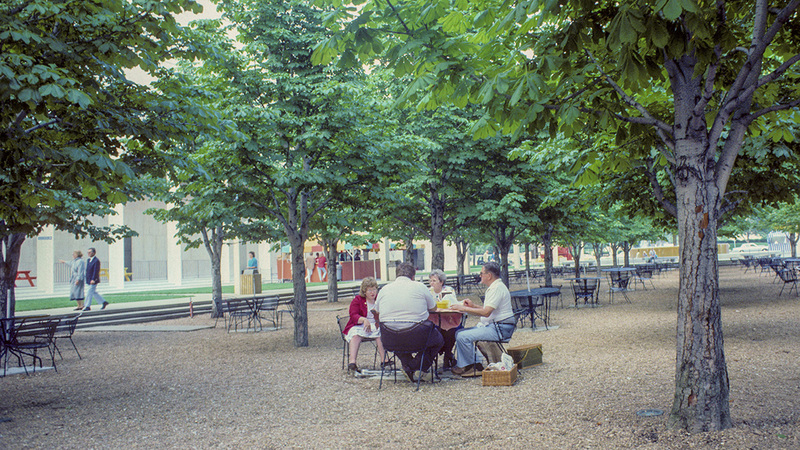 The interior of the plaza in Milwaukee was covered in crushed stone and planted with 36 horse chestnut trees laid out in a 4 x 9 grid. 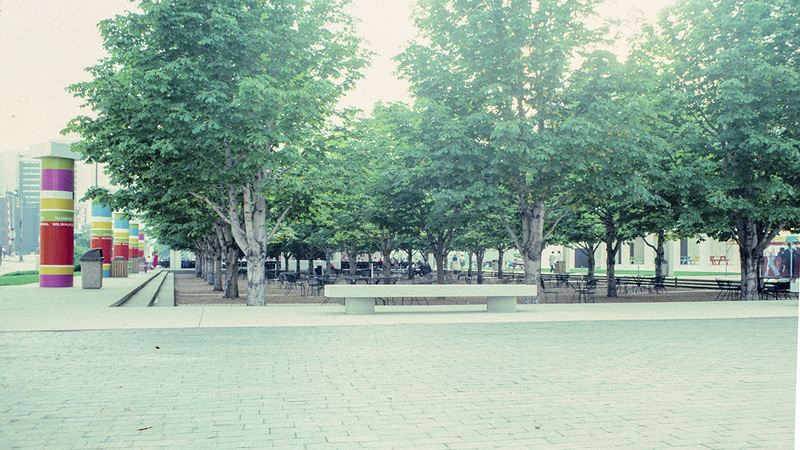 The meticulously placed rows of trees are slightly more than eighteen feet apart on the eastern end of the plaza, increasing to just over 21 feet apart on the western end. 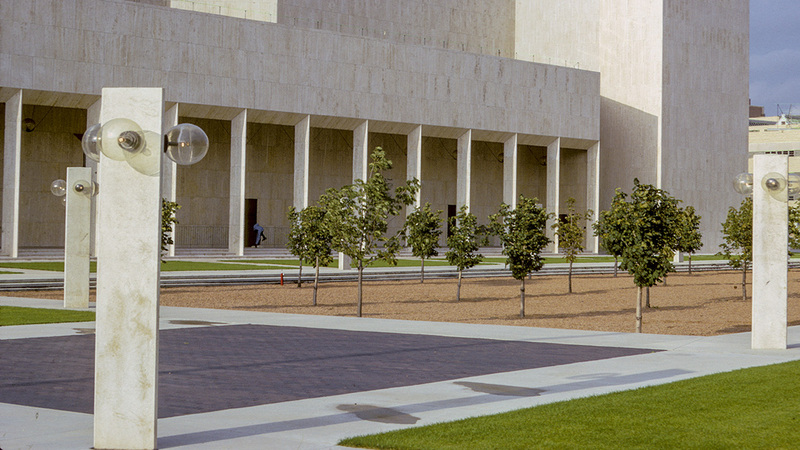 The careful spacing created the illusion of a perfect rectangle, masterfully disguising the slightly trapezoidal shape of the plaza. 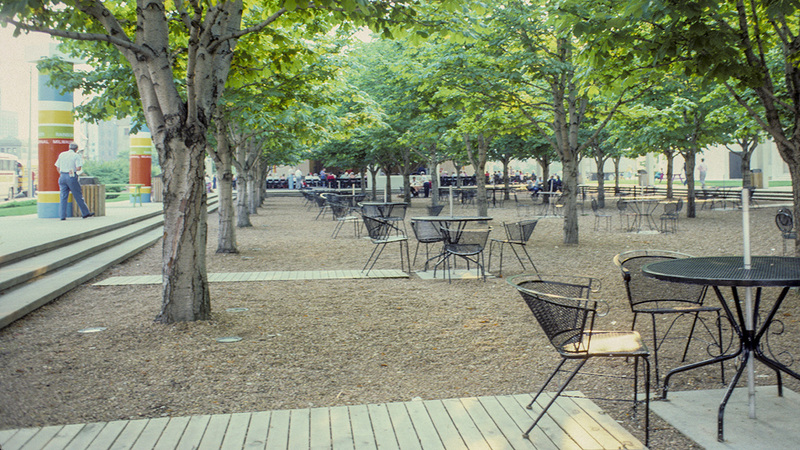 The grid of horse chestnuts speaks directly to Kiley's time in Europe, specifically in Paris, France, where, as has been well documented, he was influenced by the garden of the Tuileries (also planted with horse chestnut trees), the imperial palace on the right bank of the Seine. Complementing the simple bosque of trees in Milwaukee are twelve-foot-high pylon lights designed especially for the project by Weese. 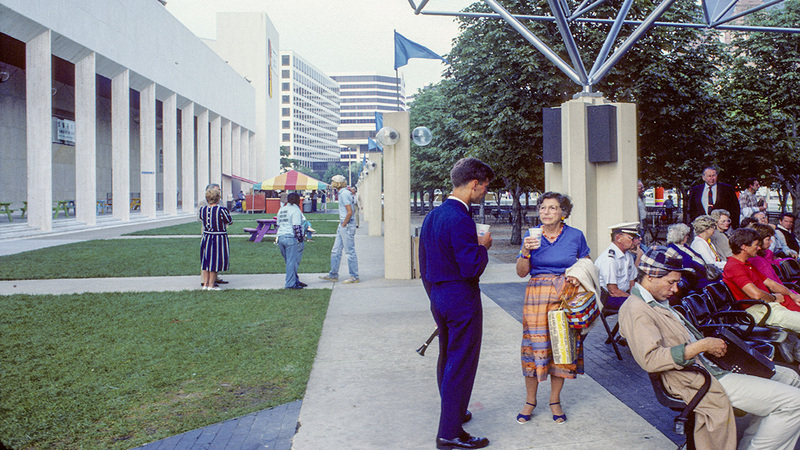 Kiley specified that moveable tables and chairs be set among the trees, allowing the plaza to function as an extension of the Performing Arts Center’s interior spaces; concrete benches were, however, installed within the plaza. 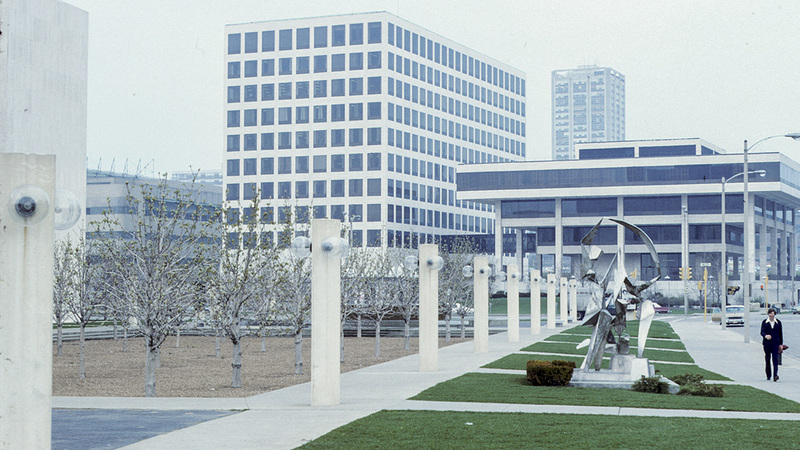 Owned by Milwaukee County, the center’s name was changed in 1994, following a $25 million donation from the Marcus Corporation in honor of its founder, Ben Marcus, and his wife, Ceil.